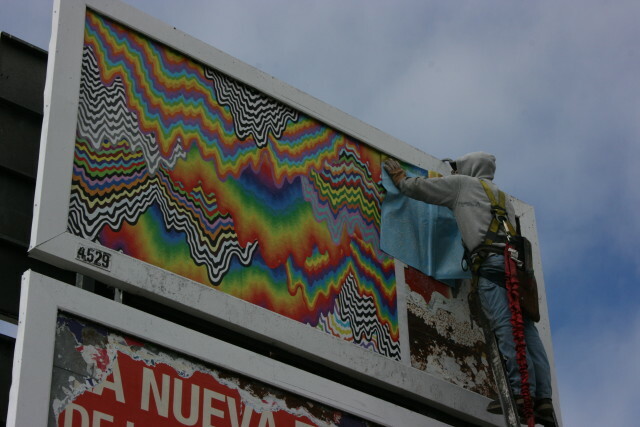 Local advertising space on Mission billboards and transit are currently being replaced with artwork from painters, photographers, and other visual artists — and tech money made it possible. Dubbed Way Out West, the outdoor exhibition graces 11 billboards, four buses and three Muni shelters in the neighborhood through August 17. It’s the first public art installation by a group project called Art City. Luke Groesbeck, who once ran a startup and worked for Eventbrite, founded Art City to help tech build a relationship with the arts community. Through its fiscal sponsor Intersection for the Arts, Art City received donations of more than $100,000 – almost entirely from tech workers. The funding went largely to advertising space (a Clear Channel billboard can cost around $8,500 a month, though Groesbeck said the project managed to find better deals) and operating costs. The artists — a collection of well-known locals mixed with some artists from around the state — will not be compensated. They will have an opportunity to sell limited edition prints of their work at a formal opening reception July 17. Zio Ziegler, whose vibrant geometric animals and figures have appeared locally on the walls of Bartlett Street and the Sycamore and will be part of Way Out West, seemed content to provide his work for the love of art, and acknowledged the support of tech workers. “They are the new patrons. Like it or hate it,” Ziegler said. One passerby seemed skeptical of the project’s expense, as he watched the pieces being installed one morning. Mission Bay-resident Benito Rivera, who remodels buildings in the Mission for a living, commented: “That’s what they’re spending money on? I love art but I don’t think the average person is going to care.” Instead, he said, he would prefer to see tech contribute to the Mission by assisting those in need. But organizers say the average person is exactly who the installation is for – those who are least likely to take the time or spend the money to visit a museum or gallery. 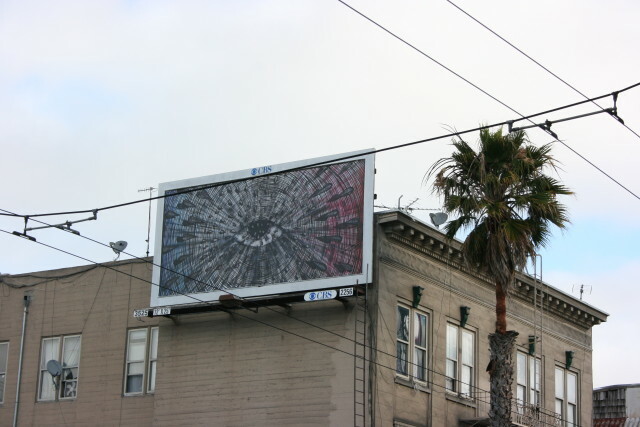 Art City’s broader vision was to turn the entire city of San Francisco into an art gallery by taking over every advertisement in the city. Way Out West is just the beginning of this effort. Part of the reason why Way Out West is taking place in the Mission is because the neighborhood has a well-established public art tradition. Colorful work by artists like Ziegler, Apex, and Andrew Schoultz have graced Mission walls for years. A few artists known for the do-it-yourself, graffiti-inspired art movement known as Mission School, like Chris Johanson and Alicia McCarthy, are included alongside L.A. and Oakland based artists in this broad-spectrum exhibition. The pieces in the exhibition explore evocative themes associated with California’s unique culture and history, and include commentary on the changes sweeping neighborhoods like the Mission. 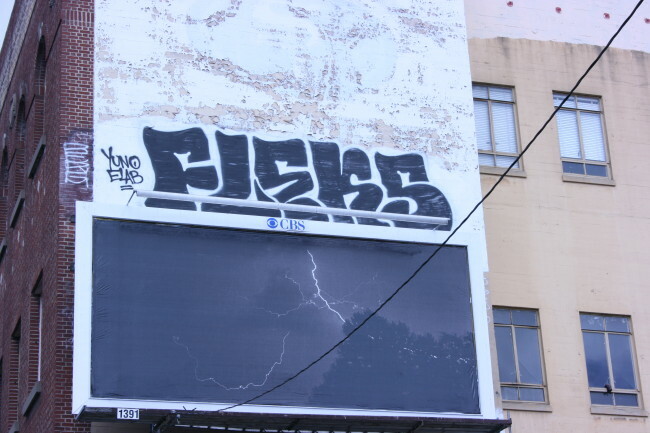 A photograph of a lightning storm, mounted above an abandoned gas station at 16th and South Van Ness, is an expression of artist Dave Schubert’s feelings about the transformation of the Mission. And for Ziegler, the idea of replacing commercial canvasses with public art is a defiant statement. “It’s not just a disruption of ads, it’s a disruption of the institution,” Ziegler said. An opening reception will be held at Heron Arts on July 17th at 7 p.m. Way Out West artwork will remain in place August 17th. Nobody threw you out of the ‘hood. If that happened, you did it to yourself either by your acts or your omissions. Take responsibility for your own life and decisions instead of looking for someone else to blame for your failures. I was wondering who would by crying first.you didn’t get thrown out. I am always for replacing ads with art, although I do not necessarily see them as separate entities. But that’s for another discussion. Bringing art to the people is becoming more and more prevalent. I’m a bit biased (because I work at Pixelist), but I really feel like certain social media, particularly Instagram, is really cracking the creative minds of people who might not otherwise have been inclined. More art for everyone, and everywhere. It can be argued that money is “better spent” elsewhere, but our nation was founded off creativity – not settling, dreaming, wanting more, believing.